Useful data on P/E ratios and other valuation metrics by Strar Capital. There isn't much to report on US equities as they remain in the range where they were last week. 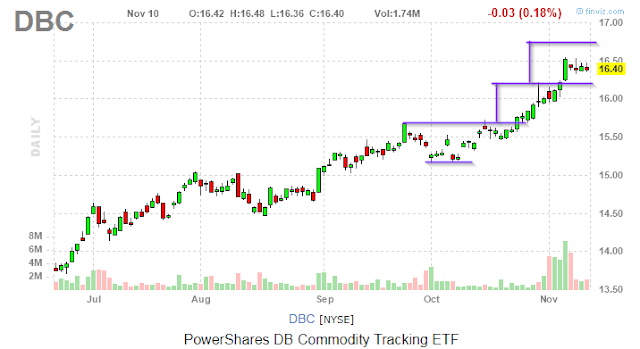 DAX correction seemed to bottom on Thursday but it retraced on Friday making a lower swing high. 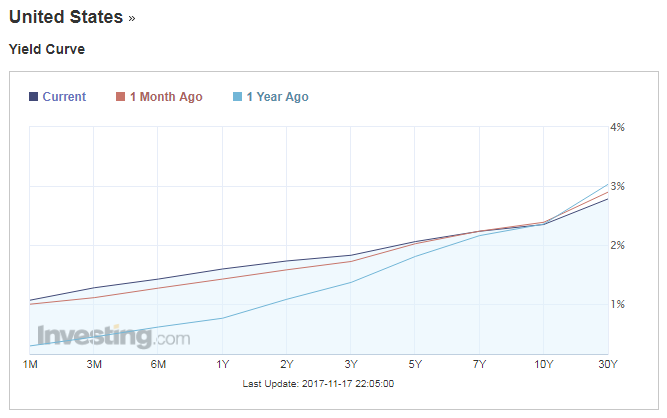 US 2y yield is making new highs, whereas 10y remains in a range flattening the curve. German 2y is still in a range. Gold made a very strong bull price action Friday (so did other metals especially platinum). 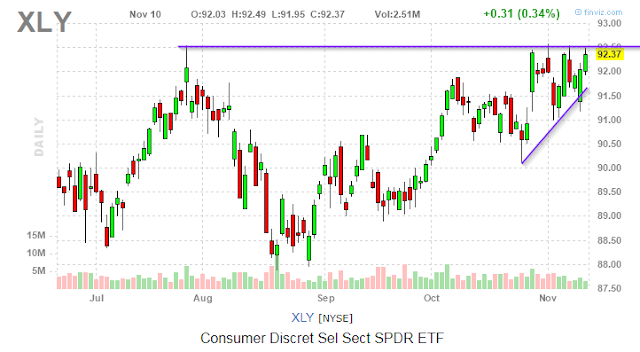 We should see how strong the 1300-1300 resistance area would be, but the strong Friday move suggest that it might not hold. The much better than expected German GDP data pushed the EUR higher, but he 1.875 resistance held firmly for the time being. I do believe that the biggest psychological enemy in trading is frustration. Frustration comes hand in hand with perfectionism as it is triggered by the conflicts in our expectations and the achieved results. Frustration is that can quickly derail us and push into either an under-controlled or and over-controlled state of mind. When frustration shifts into anger that could result in really stupid decisions we would never ever make in a controlled and balanced state of mind..
Handling frustration is one of the most valuable tool a trader might have. There are a number of very useful posts on TraderFeed by Brett Steenbarger on this topic. I've been away for a few weeks (and could be away in the coming weeks) due to my back problems, so there is a slight disconnect with my previous weekly post. 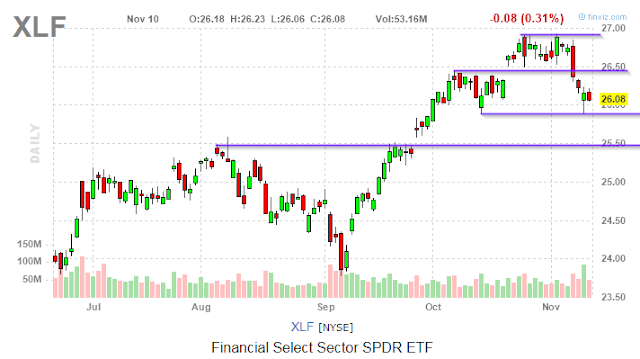 SP500 is still around the measured move level with a few pinbars that is now might not be the sign of strength. NQ made a few measured moves particularly helped by Amazon having a 7.5% weight in the index. DAX like SP500 is almost where it was four weeks ago. 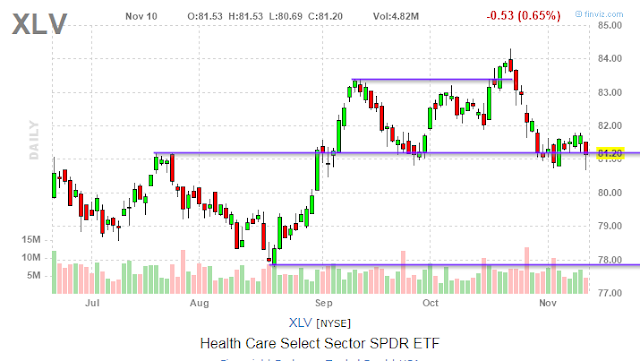 Though, it had a significant retracement from the 13500 new high (btw it is 50% of the measured move target). The much weaker than expected German Industrial Production (-1.6% vs. -0.7%expected) might have been the trigger of the selloff. 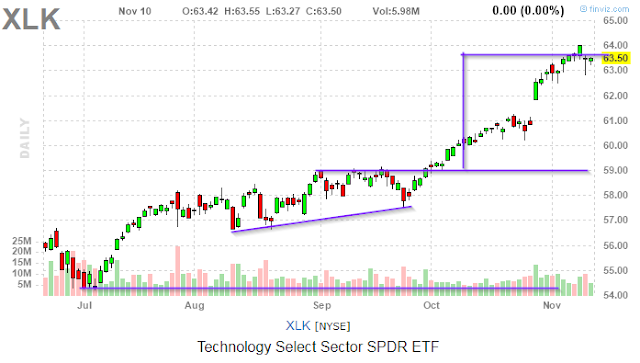 I don't feel that this data has such a particular importance, therefore, I would rather believe it was a technical correction, so I would look for buying opportunities after some sort of consolidation.On the other hand the previously mentioned SP500 perceived weakness and this selloff could make the DAX more vulnerable to any meaningful global stock market correction. Technology and Industrial are still leading, up slightly more than a measured move. The key driver was AMZN that gained more than 15% after its earnings report. 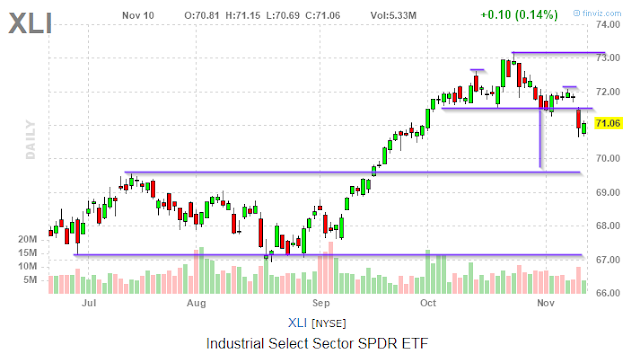 Industrials show more signs of weakness a HS like pattern.We might see the retest of the 70 area. 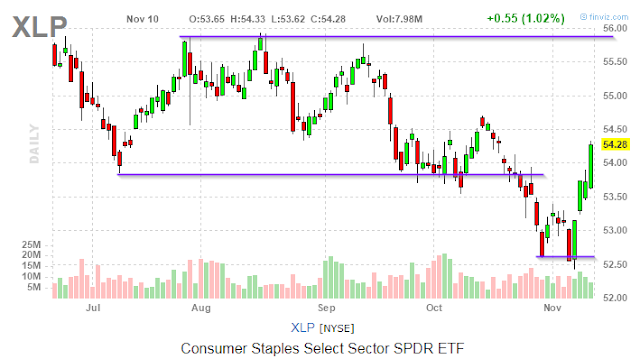 Consumer Staples made a big comeback. 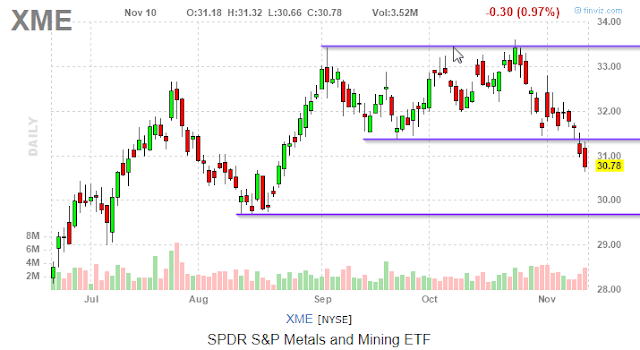 Metals and Mining are also bearish. Financials might be a good buying opportunity at the support level. 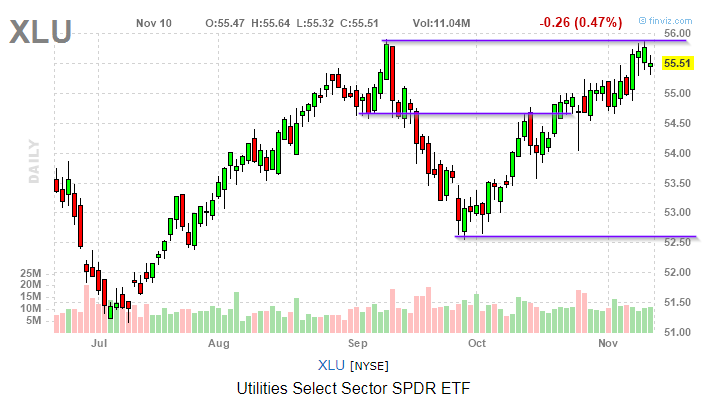 Utilities is at a strong resistance. Health Care is at a strong support. 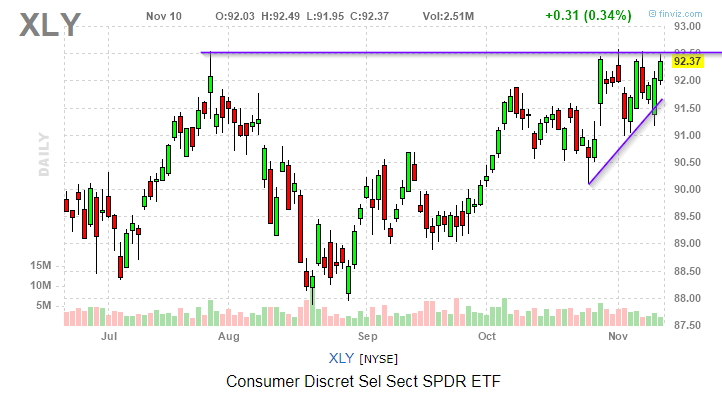 Consumer Discretionary looks to be before a breakout. Commodities moved up significantly in the last four weeks. This is a great post by Brett Steenbarger on how perfectionism can hurt your trading. "In a very important sense, perfectionistic traders are not seeking to make money. They are trying to not lose money. Their intolerance of loss keeps them moving from method to method in search of a certainty that markets cannot provide."